A dental crown or cap is a tooth-shaped cover that is placed over a weakened or damaged tooth to restore its natural appearance and prevent further deterioration. Crowns are used in cases of severely chipped or broken teeth, to cover the exposed area of a tooth following a root canal procedure, to replace a large old filling or for cosmetic reasons. When a dental filling is not a viable solution to correcting the damage sustained by a tooth, crowns can provide a long-term solution to restoring the function of your teeth and enhancing the appearance of your smile. Crowns can be made of all metal, all porcelain, or a combination of both. Because all crowns are custom made for each patient, it may take more than one appointment to complete. At your first visit, the area is numbed to make you comfortable. Your dentist in La Grange, IL will use a dental hand piece to shape and prepare the tooth so that the crown can properly fit over it. Next, impressions are taken of the prepared tooth. Often times, a temporary crown is placed to protect the tooth while the final crown is being made. The impressions are used to fabricate a model of your mouth on which the final crown is made. When your final crown is ready, dental cement is placed into the crown and it is cemented to the prepared tooth. You tooth is now restored to a healthy and functioning state! A dental bridge consists of an artificial tooth connected to a set of crowns used to fill a gap created by one or more missing teeth. 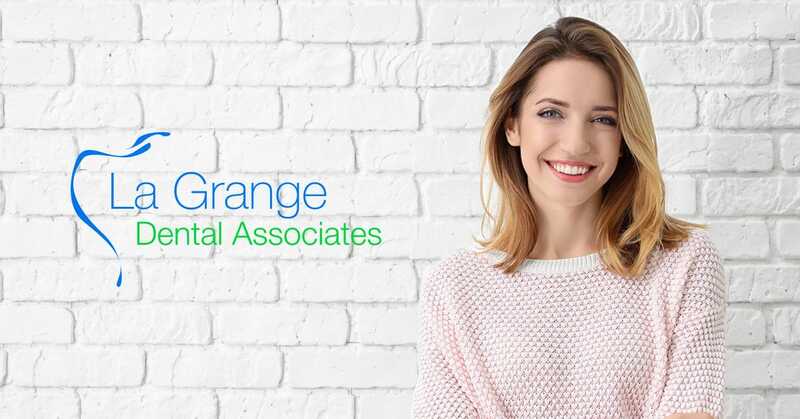 Your dentist at La Grange Dental Associates will create a custom bridge for your mouth that will look and function like your natural teeth. At your first visit, the area is numbed and a dental hand piece is used to prepare the neighboring teeth that will support the bridge. Next, impressions are taken of the prepared teeth and a temporary bridge is placed to protect the teeth. The impressions are used to fabricate a model of your mouth on which the final bridge is made. The final bridge is then cemented and anchored to the neighboring teeth, so you do not have to worry about removing or repositioning the bridge once it is cemented in your mouth. With proper oral hygiene and regular dental exams, bridges and crowns can solve the problems created by missing and damaged teeth and last for years to come.